TCP SpringLight™ Reflector compact fluorescent lamp features screw-in E26 medium base collection. 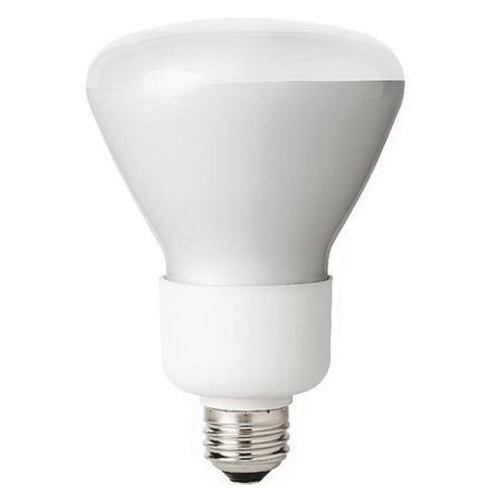 The 14-Watt, R30 bulb outputs a bright and crisp light of 645 Lumens. It features an average life of 8000 Hours and flood beam angle. The lamp in frosted finish, has 2700K color temperature and 82 CRI. It is compatible with electronic ballast and exhibits instant/modified rapid start without any delay. It has a voltage rating of 120-Volts AC and current rating of 0.23-Amp. This sealed-beam lamp is suitable for table lamps, floor lamps, ceiling fixtures, wall sconces, vanities and track lighting. The fluorescent lamp meets UL/cUL, cULus, FCC 47 CFR Part 18, RoHS, Energy Star and ISO 9002 standards.